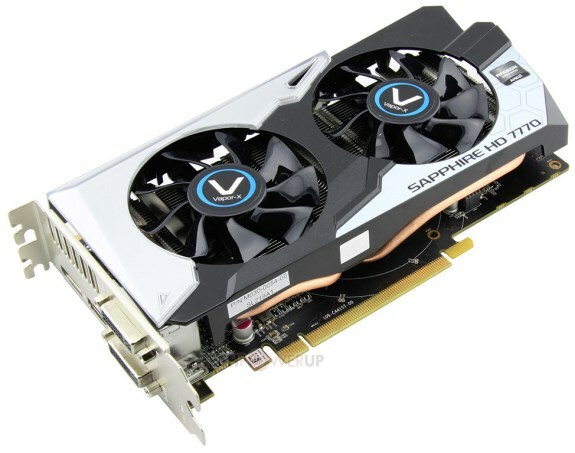 TPU reports Sapphire introduced the Radeon HD 7770 Vapor-X Black Diamond graphics card in the Greater China region. This card looks like a slight variation of the Vapor-X OC that's found in western markets, it features the Vapor-X cooler with a vapor-chamber plate, two 8mm copper heatpipes and a dense aluminium fin array cooled by two 80mm fans. Underneath it is a custom-design PCB that's dressed in black, and uses Sapphire's noise-free chokes. The card sticks to AMD reference clock speeds of 1000 MHz core and 1250 MHz (5.00 GHz GDDR5-effective) memory. It packs 1 GB of GDDR5 memory across a 128-bit wide memory interface. Power is drawn from a single 6-pin PCIe connector. Display outputs include two DVI, and one each of DisplayPort and HDMI.